The Rebel Sweetheart. 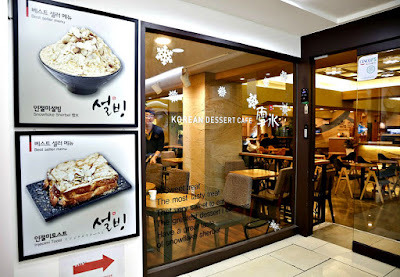 : Foodie Goodie | Sulbing Cafe. Nothing can be as refreshing as a shaved ice dessert amidst the summer heat. 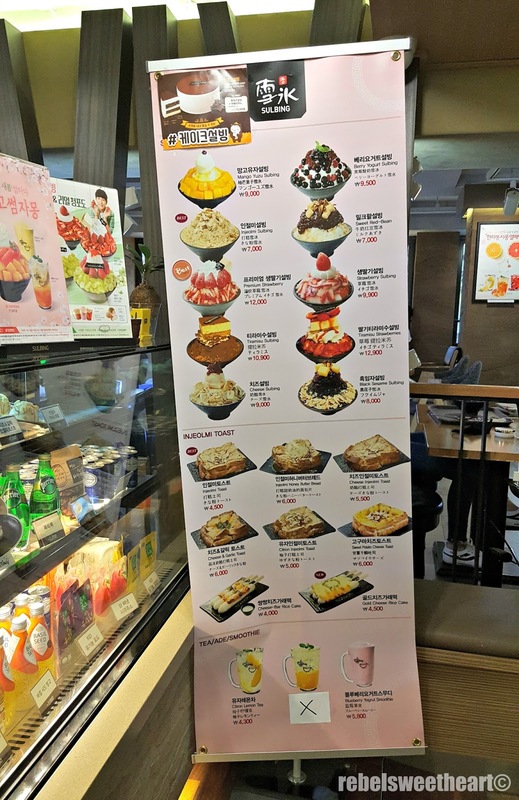 And when it comes to shaved ice desserts, you'll find a variety of them in Asia. There's halo halo in the Philippines, cendol in Singapore, kakigori in Japan (though I have yet to try the authentic Japanese version myself), and bingsu in South Korea. 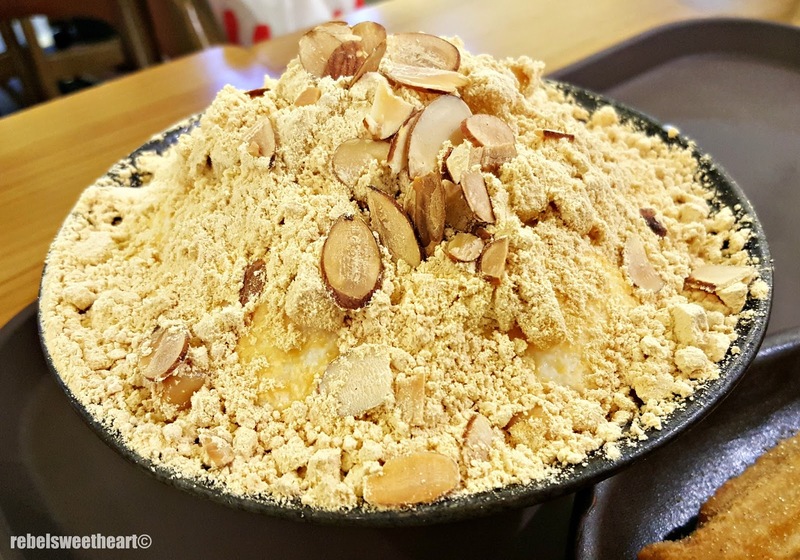 Patbingsu (팥빙수) is a popular Korean dessert which literally means 'red beans shaved ice'. That being said, this dessert is made with shaved ice, red beans, condensed milk, fruit syrup, and other sweet toppings such as chopped fruit. 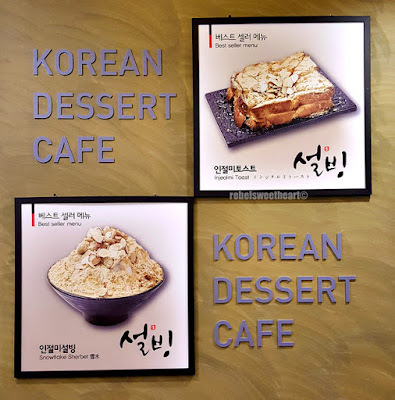 While the original version of this dessert was extremely simple - just broken bits of ice with sweetened red bean porridge - many varieties are now available, most of which have been popularized by the Korean dessert cafe chain Sulbing. 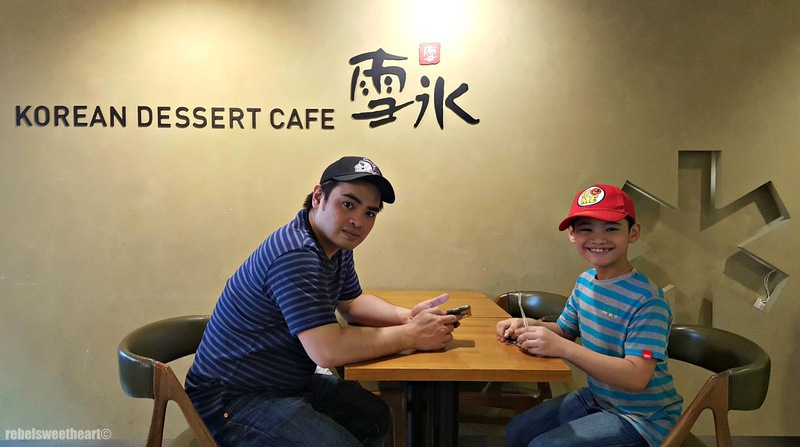 The brainchild of Jeon Song Hee, an enthusiastic Korean woman who majored in food and nutrition in college, Sulbing originated in Busan, with its first store opening in 2013. 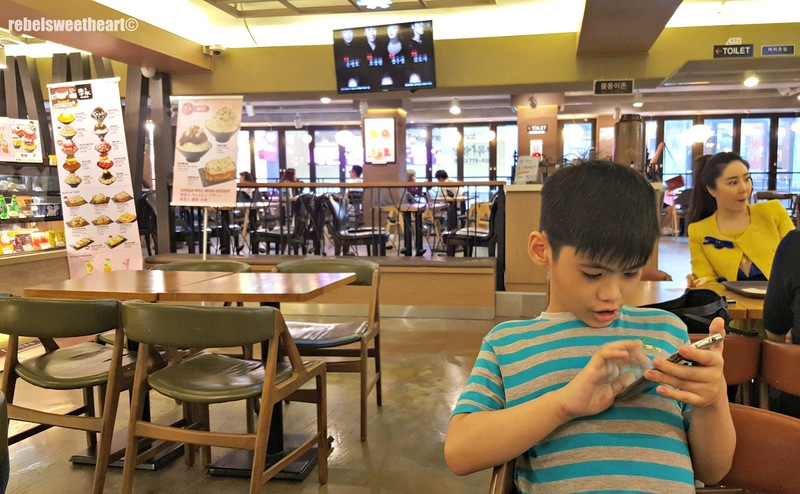 Within a year, Sulbing has expanded enormously and now has 490 franchise outlets all over South Korea. With its extreme popularity, you're bound to come across an outlet or two when you go out and about in downtown Seoul. The boys and I visited the Sulbing Cafe in Myeongdong. I reckon there are three Sulbing Cafes in the area, but the branch that we visited is the one right above the Nature Republic store. Yue busy with Pokemon Go, lol. The store was spacious and well-lighted, with a cozy ambiance to boot. The boys and I did not have a hard time getting seats as the place was not too crowded when we arrived. 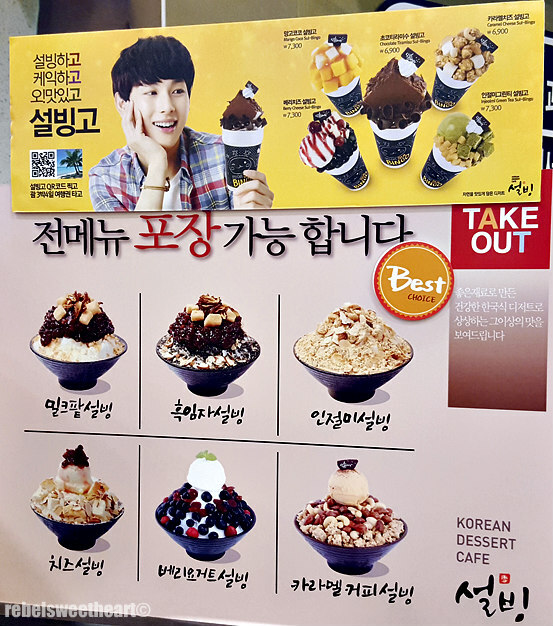 Sulbing's menu offers a plethora of bingsu flavors - from the classic Sweet Red Bean to the more decadent Tiramisu Sulbing. Aside from bingsu, Sulbing also has toast, pastries, coffee, and lemonade on their menu. Some branches also serve traditional Korean tea and traditional Korean snacks such as tteokbokki, red bean bun, and grilled sweet potatoes. The husband was a bit overwhelmed with the bingsu choices, so he let me decide which flavor to get. I ordered the best seller Injeolmi Sulbing (7000 won), which was big enough for all three of us to share. 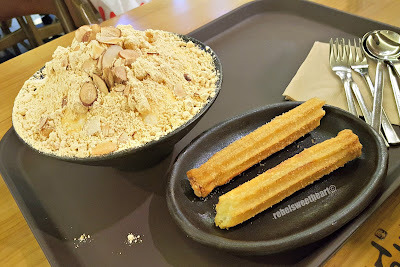 Yue saw Churros on the menu, so I got him a Churros set (6500 won) which includes a glass of what they call 'Real Fresh Lemonade'. That's the lemonade at the far right hand corner. 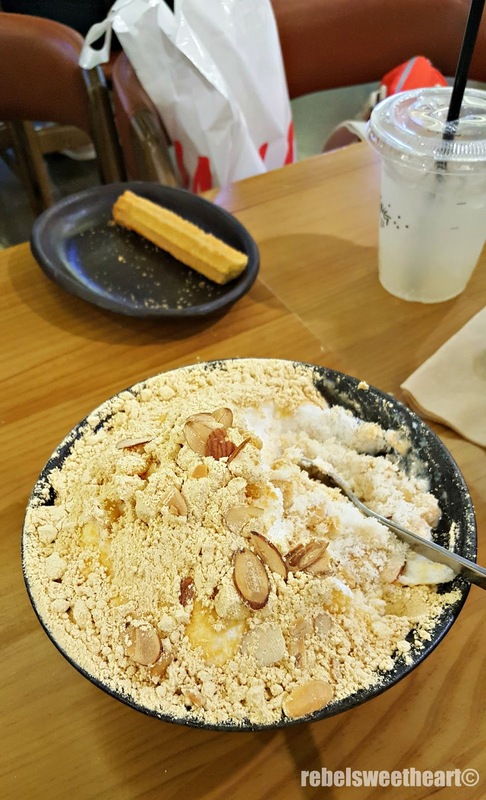 The Injeolmi Sulbing, as you can see, is topped with crunchy sliced almonds, soybean powder, and injeolmi, a variety of Korean rice cake. The injeolmi has a soft and chewy texture like mochi, which I absolutely love. 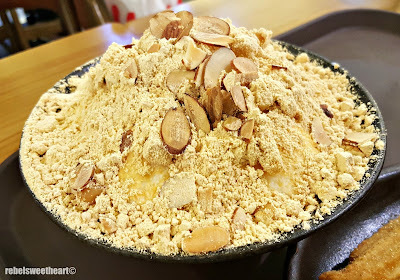 The boys enjoyed this bingsu as much as I did - it's not cloyingly sweet, and the shaved ice with condensed milk complemented the soybean powder quite well. The Churros were okay, though they're really nothing out of the ordinary. The Lemonade, on the other hand, was quite good. You'll know from the taste that they used nothing but freshly-squeezed lemons. 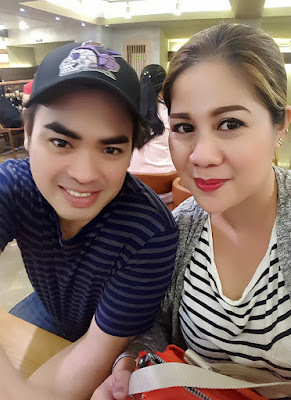 I have tried a few bingsu brands here in the Philippines, and I thought they were all quite good. Until I visited Sulbing, that is. 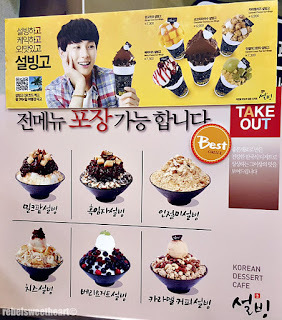 They all now pale in comparison to the bingsu that Sulbing serves, at least in my opinion. I want to eat my way around the world! Those desserts and drinks all sound incredible. The red bean is something I am quite curious about. I like freshly squeezed lemonade too. I haven't had a dessert with beans, I'd love to try it.